During the heat of midday yesterday, Dave Hursh and I headed out for some birding at one of my cherished local patches, the area I have dubbed ‘Sherman’. Sherman includes the property of the Sherman school, the Old Burying Ground, the soccer fields next to the Fairfield Museum, the ornamental plantings on the town green and Burr Mansion, and the adjacent marsh (all in Fairfield, CT). I’ve had some great birding days at this site, mostly during spring and fall migrations, and have racked up a list of over 100 species seen in the vicinity. Being the hot, humid, and blindingly sunny summer day that it was, we weren’t expecting much besides a nice chat while walking through one of our favorite places. During one of these torrid days, Sherman can usually boast little more than dozens of House Sparrows and European Starlings. Although these two species were still encountered in their usual, torrential numbers, many other breeders made themselves known. Surprisingly enough, the whole of the walk produced 21 species, a surprising number for the location and time of day. I know what you’re thinking, though. ‘Is 21 species on a hot summer day REALLY worth capitalizing the title for?’ You’re right, it’s not. Instead, it is to explain our excitement over one very special bird, a ‘mega’. In birding terms a mega is usually an extremely rare bird, far away from its native lands and habitats, in a location that it has scarcely been recorded in before, if at all. So now you must be thinking, ‘wow! he found a rarity! neato!’. Must be too good to be true. And, sadly, it is. See, although the bird we discovered could most definitely be considered ‘rare’, it’s not really a ‘rarity’, or at least, a legitimate one. 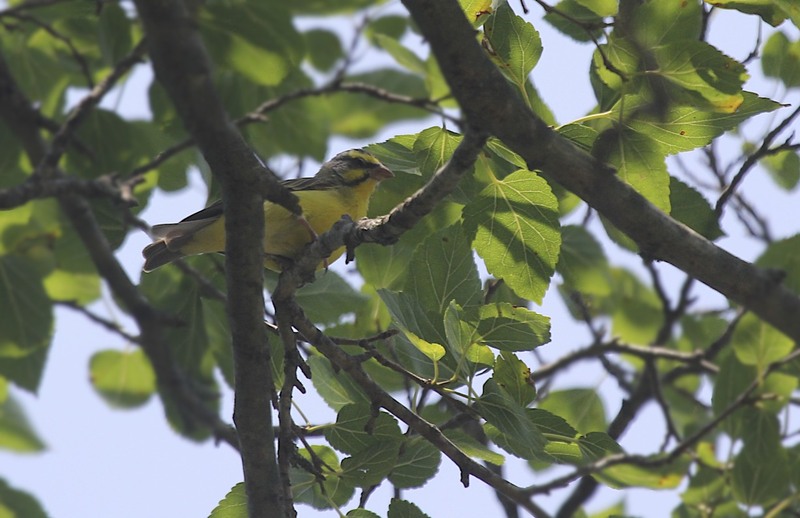 This is because the Yellow-fronted Canary we found is most definitely an escaped cage bird. It’s not that I have anything against this species, but to be a legitimate rarity, it must have been possible for a bird to have reached the location it was discovered at on its own power, and the possibility of the bird being a captive escapee has to have been ruled out. Unfortunately, in this case, it is unlikely that this small, 5” bird reached the Northeast all the way from Sub-Saharan Africa, and what’s more, this bird is common in the bird trade. It was still a terrifically exciting find nonetheless, and really had us guessing for a few moments. We jotted down complete and detailed notes, noting appearance (plumage, size and shape), behavior, and vocalizations. We noticed pretty quickly, though, that this was no North American bird, and almost immediately I blurted out, “canary? !”, knowing that this bird looked like something I’d seen before somewhere, albeit not in the field. 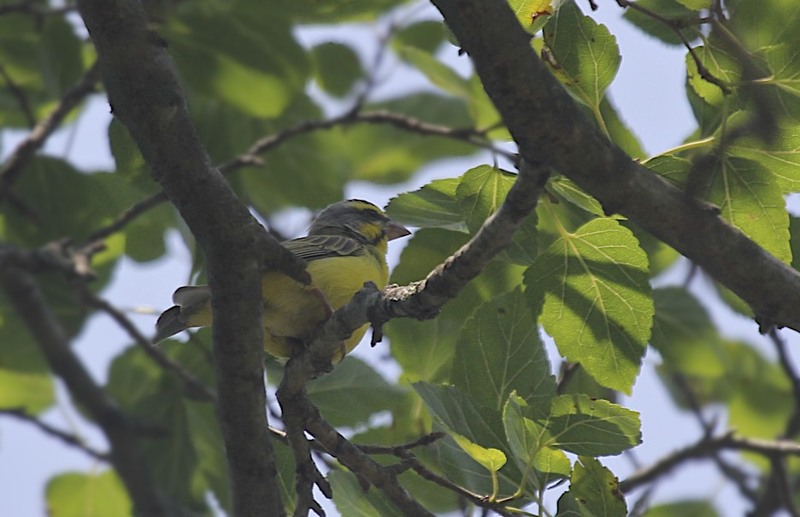 We spent a good deal of time watching the bird foraging sluggishly in the tops of the trees in the Old Burying Ground before it really surprised us by breaking into full song, which sounded almost like a mix between that of an American Goldfinch and a Lark Sparrow. Several times, we were amazed as we watched this individual chase away a number of American Goldfinches, a very similar-looking species. At last, we had obtained photos, detailed notes, and good looks. The bird suddenly flew off towards the southeast corner of the Burying Ground, and I finally had the opportunity to pull out my iPhone and take a look at The Sibley app. There, pictured near the very end of the taxonomic list, was a complete visual match to what we had just seen. The description noted, “Native to Africa. Closely related to the Common Canary, this species occasionally escapes from captivity in North America.” It seemed like we had found a perfect match. A later check in one of my Africa field guides confirmed that suspicion. Upon returning home I remarked to Dave, “I really feel like I just saw a life bird.” He felt the same way. Although not a ‘real’ life bird, it was still incredibly cool to see, as are all exotic birds seen in the wild. It is because of humans that these birds have been transplanted into new and unfamiliar areas, and it is certainly interesting to see how exotics cope with their new surroundings. Some don’t make it. Over the centuries there have been thousands of failed introductions all over the world. But some, not only survive but flourish. Wild Turkeys in Australia, Lady Amherst’s Pheasants in Britain, Red Siskins in Puerto Rico, and all of our established psittacids, not to mention our friends, the House Sparrow and European Starling are some examples of birds that have been able to start a new life in an alien world. It will be interesting to see what has become of our little friend when I return from my two trips, the first of which, begins tomorrow. Will he still be there? Or will he have moved on; either not able to cope with his new environment, or looking for a more suitable area? Lastly, anyone missing a Yellow-fronted Canary in Fairfield?? This entry was posted in Fairfield Birding. Bookmark the permalink. 4 Responses to MEGA at Sherman! Wow, Alex….I enjoy your descriptions so much; you are an excellent writer! I hope that beautiful bird survives and am glad you saw it. Again, bon voyage! Alex, I’m so happy to see that you are recovered enough to go birding on this less than pleasant day. enjoy your trips! My name is Mackenzie… I used to go to school with you at Unquowa. I heard that you had a blog and started reading, and it’s really amazing. 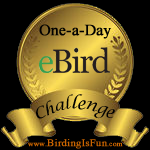 Your pictures are amazing and it’s really interesting to read about all the different birds you see. I’m so happy that you are feeling alright, and your fight against cancer is amazing… you have such an admirable attitude.